I have a challenge with side dishes. While I have a large number of recipes that I draw upon for main dishes, I find I return to the same old standbys for side dishes. This challenge becomes greater in low-carb land. No rice, no potato, no pasta and no bread. While I generally have some steamed or roasted vegetable as a side, to round out the plate I often look for a third item. Friday night I was faced with such a challenge. While spending time away from home, I was shopping for dinner and needed a second side that was low carb. My solution? Make it an appetizer. Cheese: a wedge of blue, a wedge of a Merlot flavored hard cheese and mozzarella. A stylish tray indeed. If I make a tray like this in the future, what other items should I be sure to include? Send me a comment with your favorite choices. 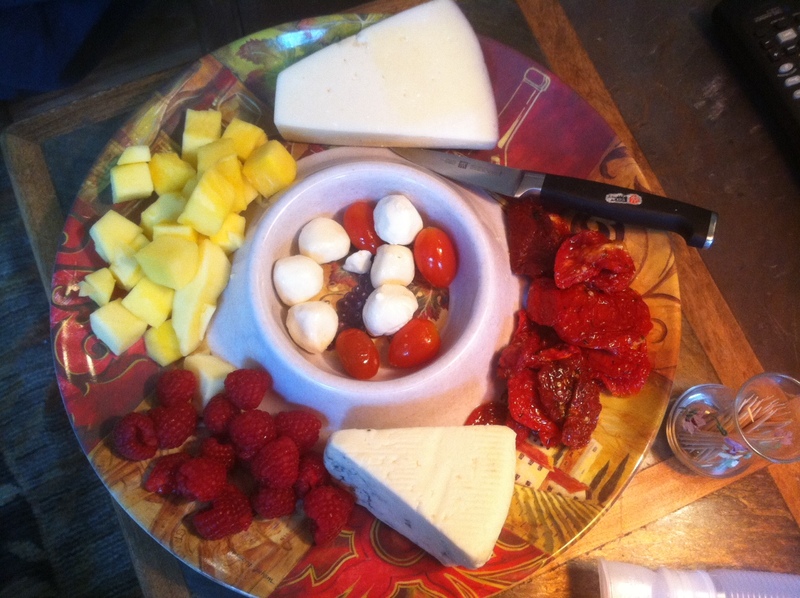 I often include nuts or even prosciutto/salami on an antipasto platter like this. Lovely platter. I might have added some Kalamata Olives.